Devin Funchess, 41st Overall, Carolina Panthers- Early in the season Funchess was projected to go mid-first round in this years draft. After an up and down season for Funchess his stock dropped a fairly large amount. 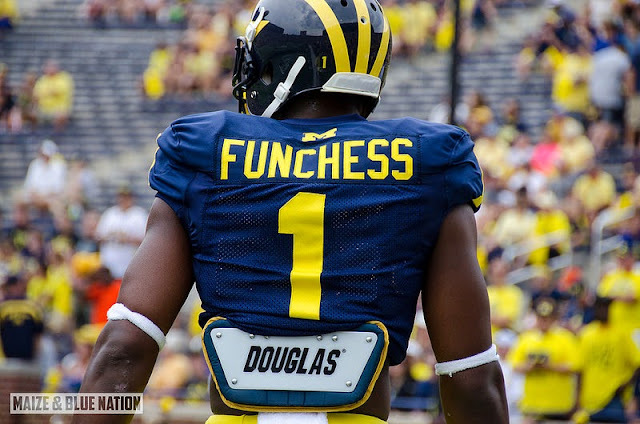 Issues with drops and lacking breakaway speed compared to other wide receivers in the NFL made drafting Funchess in the first round questionable, but his talent is undeniable. The Panthers got a great pick in the 2nd round of the draft by taking Funchess to add to an already big receiving unit. Funchess lined up opposite of Kelvin Benjamin, and having Greg Olsen on the field at the same time will cause major matchup issues. The matchup problems will benefit all three, and Funchess will likely be considered the third best of this group, and will overmatch most lined up against him. Frank Clark, 63rd Overall, Seattle Seahawks- There is probably no better team Clark could have been selected by. Another strong prospect out of The University of Michigan who saw his stock dip. After Clark's domestic violence incident, he was labeled with character issues and most teams stayed away. Seattle swiped him in the 2nd round and will likely look for him to produce as a depth defensive lineman who will sub in and out frequently to give the regulars a quick breather. No matter where Clark lines up he will be surrounded by loads of defensive talent, and won't be the most feared player on the field, because of that offenses will focus more on the bigger threats, and Clark would capitalize. Look for Clark to be a sneaky good depth lineman under Pete Carroll. Jake Ryan, 129th Overall, Green Bay Packers- While most fans in the state of Michigan may not have been happy with where Ryan landed, I think he went to a great team. Ryan is a versatile linebacker who can play weak side, strong side, and middle. Being able to play in an aggressive system for linebackers, and playing alongside Clay Matthews will be a major help for Ryan. Jake Ryan is the type of player who gives 110% and despite most likely not being a defensive regular to start the season, should make a major impact on special teams. If a Packer linebacker gets injured, there should be no worries about Jake Ryan stepping in and playing. Brennen Beyer, Baltimore Ravens- Beyer was scooped up by new Wolverine head coach Jim Harbaugh's brother John. Beyer is another versatile defensive player having played both linebacker and defensive end. In his time at Michigan Beyer started 27 times as an end, and five times as a linebacker. His versatility will help him compete during the Ravens training camp and pre-season but ultimately it will be quite difficult for Beyer to find himself a roster spot, and get a contract. Beyer very will could be kept on the practice squad due to his versatility on defense, and get work in at both positions to potentially compete next year, or fill in for an injury. If Beyer is able to impress the Ravens staff enough to earn a roster spot, I wouldn't expect much more than being an average special teams player. Devin Gardner, New England Patriots-The thoughts on Gardner have changed just recently in the past few hours. Gardner who was recruited as a QB, but moved to wide receiver, then back to QB has all the athleticism someone can dream of. Gardner insisted on sticking at QB heading to the draft, and that may have hurt him. After the signing I thought Gardner's only chance at a New England roster spot was at wide receiver, mainly due to the fact that the Pats have been weak at the position since the departure of Randy Moss. Hours ago, it was announced that former Wolverines Tom Brady will be suspended for the first four games. Gardner's chances at making the roster now have gone up, as he could be considered as a safety net, or emergency QB, while playing receiver. I think Gardner has a very sneaky good chance at making this roster as perhaps the last receiver they keep, and could pop up on the depth chart as the third string QB even. We all know what Belichick did with the other former Wolverine QB on his roster.